The first, true all-screen smartphone? 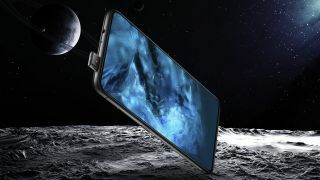 A new smartphone from Chinese company Vivo includes an in-display fingerprint scanner and pop up selfie camera to allow for the highest screen-to-body ratio we've ever seen on a phone - and you'll actually be able to buy (in some countries). The new Vivo Nex has just been announced in China, and the smartphone features a variety of high-end specs with a 6.59-inch bezeless AMOLED display on the front. The Nex has a screen-to-body ratio of 91.24%, which means the bezels around the edge of the screen are particularly slim. The best screen-to-body ratio on a phone before this was the Essential Phone with 84.9%. How has Vivo managed to achieve this? There's no notch or thick bezel along the top of the phone to house the selfie camera and other technology, such as the earpiece, with the company including three new pieces of tech instead. A pop-up camera? What will they think of Nex? First off is the company has included an 8MP front-facing camera that pops up from the top of the phone's body when you want to take a quick selfie shot. There's no traditional earpiece speaker either. Instead the company has a technology called Screen SoundCasting that turns the display itself into the loudspeaker so you can hear the person speaking on the phone. The third way to make the phone's bezels particularly slim is the in-display fingerprint scanner, which is Vivo's third attempt at the technology after previous phones like the X20UD and X21. Vivo claims this technology is more accurate and faster than ever before, and if allows you to securely unlock the phone by placing your finger on the bottom half of the screen. If this all seems awfully familiar, that's because we saw a concept of the Nex earlier this year at MWC 2018. In terms of internal spec, the Vivo Nex features the latest Qualcomm Snapdragon 845 chipset that we've seen perform well in some top-end phones announced this year like the OnePlus 6 and variants of the Samsung Galaxy S9. On the rear of the phone is a dual sensor camera, with a main 12MP f/1.8 sensor and a secondary 5MP f/2.4 offering. It also comes with optical image stabilization and an LED flash on the rear. The Nex also packs in 8GB of RAM, 256GB of internal storage (but no microSD support) and a 4,000mAh battery. The phone is also set to launch in both black and red colors. How long will it be top? The concept phone Vivo announced MWC 2018 had a 98% screen-to-body ratio, and the Nex is a big step for forward to achieving that goal on a phone you can actually buy. Rival company Lenovo has teased a launch event for June 14 that will bring an even higher screen-to-body ratio than the Nex. One teaser even suggested it'll have a 95% or more ratio but we'll have to wait and see if Vivo can be beaten by this new device. It's worth noting we don't currently have any word on whether the Vivo Nex will be coming to other countries around the world. We hope it will be launching in other places, but right now it's only confirmed as a device for those in China where the price has yet to be revealed. TechRadar is currently in China at the launch of the new Vivo phone, so we'll be testing out the phone as soon as possible to give you our verdict on this next-generation device.